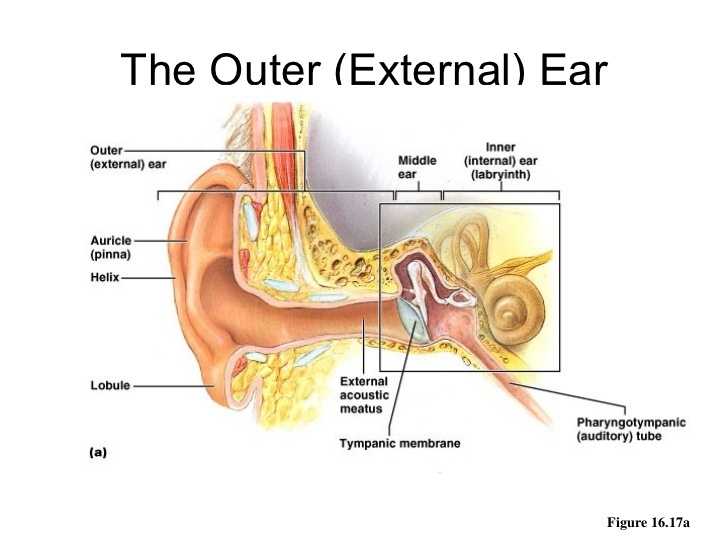 The outer ear is the external portion of the ear, which consists of the pinna and external auditory meatus. It gathers sound energy and focuses it on the eardrum (tympanic membrane). 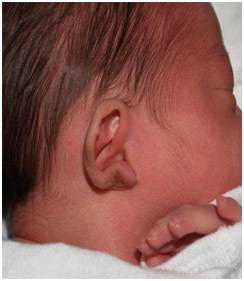 Anotia (“no ear”) describes a rare, congenitaldeformity (birth defect), that involves the complete absence of the pinna, the outer projected portion of the ear, and narrowing or absence of the ear canal. 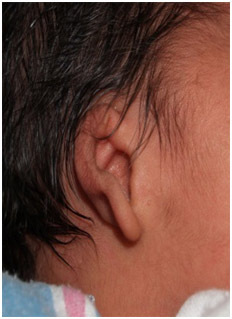 This contrasts with microtia, in which a small part of the pinna is present. 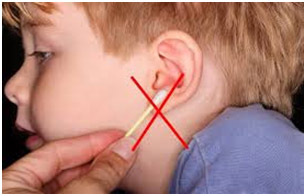 Anotia and microtia may occur unilaterally (only one ear affected) or bilaterally (both ears affected). This deformity results in conductive hearing loss, deafness. External otitis is an infection of the skin of the ear canal. External otitis is caused by bacteria or, rarely, fungi. Typical symptoms are itching, pain, and discharge. A doctor looks in the ear with an otoscope for redness, swelling, and pus. External otitis may involve the entire canal, as in generalized or acute external otitis, or just one small area, as when pus accumulates in a boil (furuncle) or pimple. 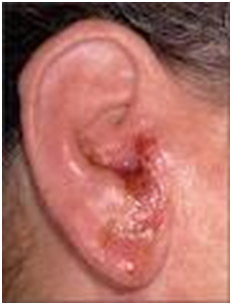 An unpleasant-smelling white or yellow discharge drains from the ear. Fungal external otitis causes more intense itching than pain, and people have a feeling of fullness in the ear. It develops in the inner ear. In some cases, otitis externa can spread to the outer ear and surrounding tissue, including the bones of the jaw and face. This infection is known as malignant otitis externa. The condition is not caused by water remaining in the ear canal. The condition is caused by bacteria such as Pseudomonas aeruginosa. People have severe earache (often worse at night), a foul-smelling discharge from the ear, pus and debris in the ear canal, and usually decreased hearing. In severe cases, paralysis of nerves in the face and head may occur as the infection spreads. Yellow or green drainage from the ear that is persistent and foul-smelling. Ear pain that gets worse when moving the head. Persistent itching in the ear canal. Weakness in the facial muscles. 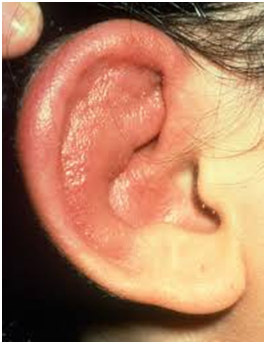 Perichondritis is infection of the tissue covering the cartilage of the auricle (Pinna). Injuries, burns, insect bites, ear piercings through the cartilage, or a boil on the ear may cause perichondritis. The infection also tends to occur in people whose immune system is weakened and in people who have diabetes. Pus accumulates between the cartilage and the layer of connective tissue around it. 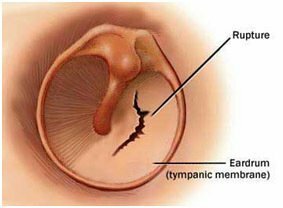 An eardrum rupture is a small hole or tear in your eardrum, or tympanic membrane. The tympanic membrane is a thin tissue that divides your middle ear and outer ear canal. This membrane vibrates when sound waves enter your ear. The vibration continues through the bones of the middle ear. You hear sounds because of this vibration, so your hearing can suffer if your eardrum is damaged. A ruptured eardrum is also called a perforated eardrum. In rare cases, the condition can cause permanent hearing loss. Filled with pus in the affected ear. 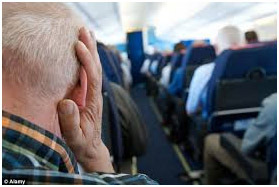 Tinnitus (a ringing or buzzing in the ears). If its severely ruptured, you might suffer from additional symptoms( dizziness or a weakness in your facial muscles). 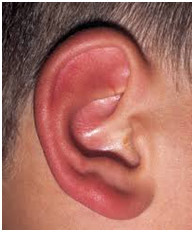 Pinna abnormalities and low-set ears refer to an abnormal shape or position of the outer ear (pinna or auricle). In diabetics or immune-suppressed individuals, chronic external otitis can become a very serious disease. Malignant external otitis is a misnomer because it is not a tumor or a cancer, but rather an aggressive bacterial (Pseudomonas) infection of the bone that can lead to infection of the base of the skull. Chronic swimmer’s ear is when the outer ear and ear canal become infected, swollen, or irritated, on a long-term or recurring basis. 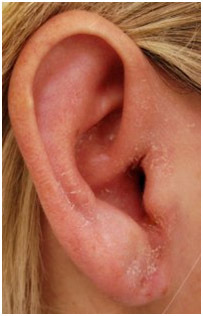 Water trapped in your ear after swimming often causes this condition. 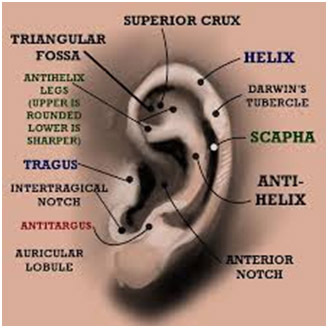 The ear’s structure and the water left in the ear after swimming combine to create an ideal damp, dark space in which bacteria and fungi can thrive and cause infection. 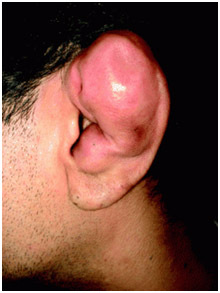 Swimmer’s ear occurs fairly often in children and teenagers, especially those who swim regularly. Microtiais a congenital deformity affecting the outer ear (pinna) where the ear does not fully develop during the first trimester of pregnancy. A Microtia ear is often smaller in size, can have a peanut shaped appearance, only have a small nub or lobe present, or be completely absent at birth. Microtia can affect one ear (unilaterally) or both ears (bilaterally). 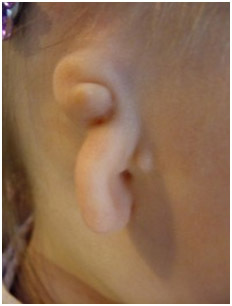 Microtia is often accompanied by Atresia. 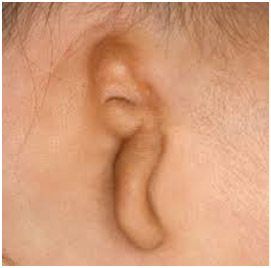 Atresia (also known as aural atresia) is the absence or closure of the external auditory ear canal. The malformation of the middle ear bones (incus, stapes, and malleus) may be affected including the narrowing of the ear canal, known as canal stenosis. The purpose of this wax is to keep dust and dirt particles from reaching the eardrum. This wax will either dry out and fall out of the ear, or else work its way to the outside where it can be wiped off. 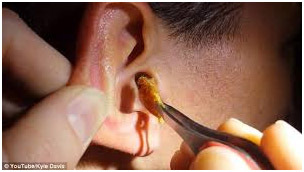 Sometimes attempts to clean the ear only serve to push the wax deeper into the ear canal, causing a wax blockage. This is one of the most common causes of hearing loss. The pinna being exposed to variations in temperature and the blood vessels being superficial (deep only to the skin), extremes of cold affect it readily. Frost bite occurs particularly in the upper portions of the pinna. A soft cystic swelling may develop on pinna due to collection of fluid under the skin. There is no definite cyst wall. This fluid is due to trauma of which the patient may be unaware. It is a fungal infection of the ear. The disease is more frequent during the rainy seasons as the increase in humidity leads to rapid growth in fungus. The conditions may follow from swimming in infected water. Hearing loss and balance problems can happen when there’s damage to key parts of the ear, like the eardrum, ear canal, ossicles, cochlea, or the vestibular nerve. Cuts, scrapes, burns, or frostbite. When there’s an injury (even minor) to the outer ear or ear canal, bleeding and infection can affect other parts of the ear. Loud noise Kids can have significant or permanent hearing loss when they’re exposed to really loud noises daily or over a long period of time. 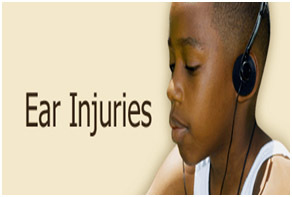 This is called acoustic trauma or noise-induced hearing loss. Sudden, significant change in air pressure. When we fly or scuba dive, air pressure decreases as we go higher and increases as we go lower. If the pressure isn’t equalized, the higher air pressure pushes on one side of the eardrum and causes pain and sometimes partial hearing loss, called barotrauma.